Spring is finally here...along with the thunderstorms but my basement hasn't flooded for three whole days. Only one lesson arrived while I was out west. Several boxes full of yarn for the yarn tasting did arrive. I must say, it is fun opening them even if I know the yarn isn't for me. This week's tip is quite esoteric. It was a request from Susanmarie (on Ravelry). She was knitting a pair of toe up socks and was using a tubular bind off and was curious as how to finish it off. I've done lots of videos on the tubular bind off but I'd never discussed how to finish one off. When you do a tubular bind off in the round, there are a few differences than doing it flat. The first step in the bind off is to work 2 or more rows where you knit the knit stitches but slip the purl stitches with the yarn in front. This direction works for flat knitting since when you turn the work, the knit stitches become purl stitches. When you work in the round, this doesn't happen. When you work the second round, it is necessary to work the purl stitches and slip the knit stitches with the yarn in the back. The technique I use for tubular bind offs is from (I believe) Katarina Buss's Big Book of Knitting (a wonderful book) and after you have worked the slip stitch rows, you position the stitches so that the first stitch on the left needle is a knit stitch. 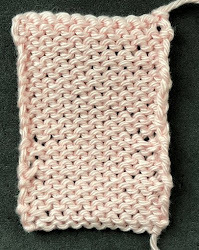 A purl stitch is the first stitch on the right needle. For the tubular bind off to look right, you have to go into each stitch twice. To start, you go into the purl stitch knitwise and then into the left leg of the knit stitch on the right needle and into the right leg of the next knit stitch on the left needle (skipping over the purl stitch). You then go into the same purl stitch purlwise and drop it and the knit stitch from the left needle. Salon will be on Saturday from 1:30 to 4:00. I am almost finished with the Wine Dark Sea sweater. The back and fronts are finished and I did the neck band. I like to break up a project like this. Finishing this requires full daylight sun and it will take several days to seam it. One sleeve is done and I hope to finish the other tomorrow. I really love this sweater. The photographs below show the colors much better. You can see the dental elastics I have used to mark the increases in the sleeve. Yes, I could have done it in the round but my stranded tension is MUCH better when I work it flat. If someone is crazy enough to knit this sweater, they can always knit it in the round. Here is the back. I wanted a deeper neckline than the traditional crew. I am confused about the second paragraph after the wavy sweater picture. You say that we have to position the stitches so that a knit stitch is first on the left needle. Then: we go into the purl stitch knitwise, left leg of knit stitch, purlwise into purl stitch, a d drop off purl stitch and knit stitch. My understanding of these instructions is that we should position the stitches so that a *purl* stitch is first on the left needle. Please any help would be appreciated. Do you have a video of the beginnng? I am so confused.